preliminary research might be one of these. was recognised by mach3 in virtualbox on windows 7 after putting the nc200 driver in the plugins folder. was not usable / recognized on linux. 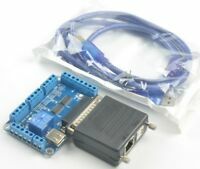 https://www.ebay.ca/itm/NVUM-6Axis-CNC-Controller-MACH3-Ethernet-Interface-Board-Card-Fr-Stepper-Motor/192184997215 looks interesting , 200 khz and it can be debugged over ethernet instead of the usb like another version of nvum interfacing.